Definition, Characteristics of Caravaggio's Tenebrism, Chiaroscuro. The term Caravaggism describes the techniques of tenebrism and chiaroscuro popularized by the radical Italian Mannerist painter Michelangelo Merisi da Caravaggio (1571-1610), and used by him in his religious art, genre paintings and still life, which was subsequently widely adopted by other contemporary artists in Italy and across Europe. In fact, not only was his style widely copied - particularly because its naturalism made it a perfect vehicle for Catholic Counter-Reformation Art - but also his signature chiaroscuro became a defining element in the new era of 17th century Baroque art, not least in the work of virtuoso portraitists Diego Velazquez and Rembrandt van Rijn. His artistic skills and reputation were acclaimed by his contemporaries despite his violent personal lifestyle, which led to his early demise at the age of 38, having completed no more than about 60-70 paintings.  The Calling of Saint Matthew (1599-1600) San Luigi dei Francesi, Rome.  The Martyrdom of Saint Matthew (1599-1600) San Luigi dei Francesi, Rome.  Conversion on the way to Damascus (1601) Santa Maria del Popolo, Rome.  Crucifixion of Saint Peter (1601) Cerasi Chapel, Santa Maria del Popolo.  Amor Vincit Omnia (1602) Gemaldegalerie SMPK, Berlin. In contrast to his leading contemporary Annibale Carracci (1540-1609), Caravaggio rejected conventional idealization, whereby a painting was composed to satisfy more the taste for gracefulness and harmony, than for truth. Instead he employed a bold, indecorous realism, enhanced by a shadowy chiaroscuro and a dramatic use of light and shade (tenebrism). His religious figures were based on male and female models recruited off the streets, whom he painted directly from life without any drawings or preparatory sketches. As a consequence, he succeeded in creating an immediate and powerful effect, whose dramatic quality was accentuated throughout his paintings by his use of boldly contrasting light and dark. Not all patrons found Caravaggio's realistic treatment of religious themes to their liking, which led to several of his works being rejected. However, because of his populist celebrity, these rejected commissions were usually snapped up by cardinals and wealthy noblemen. See also: Classicism and Naturalism in Italian 17th Century Painting. Caravaggism embraces both chiaroscuro and tenebrism. Because both techniques involve the pronounced use of light and shadow, they can be confused, even though there is a clear theoretical difference between the two terms. Chiaroscuro is a method of shading which is used to give figures a sense of three-dimensional volume. Tenebrism is where an artist keeps some areas of a painting totally black, allowing one or two areas to be strongly illuminated by comparison. Tenebrism thus allows the artist to control the 'action' in his canvas. Who Were the Most Important Caravaggisti? Caravaggio's signature style of tenebrism influenced the development of Flemish Baroque art and the neighbouring Dutch Baroque, as well as Spanish Baroque art. Leading exponents of the Caravaggesque style included the eminent Italians Orazio Gentileschi (1563-1639), his outstanding daughter Artemisia Gentileschi (15931656) - best known for her well-worn masterpiece Judith Beheading Holofernes (1620, Uffizi, Florence) - and the tavern scene painter Bartolomeo Manfredi (1582-1622), along with the Naples-based Spaniard Jusepe Ribera (1591-1652), noted for his intense religious works. Due to the influence of Quietism (which preferred the closest possible contact between artist and spectator: a key benefit of Caravaggio's realistic figures) Naples became an important source of Counter-Reformation religious paintings, and an important centre of Caravaggism. In addition to Ribera, practitioners included Battistello Caracciolo (1578-1635), Mattia Preti (1613-99), Guido Reni (1575-1642), and many others. 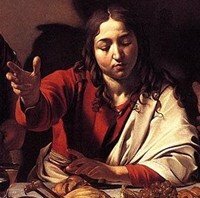 For more, see: Caravaggio in Naples as well as Painting in Naples (1600-1700). For early 17th century caravaggesque art in Naples, see: Neapolitan School of Painting (1600-56); for later artists, please see: Neapolitan Baroque (c.1650-1700). In Holland, where the Utrecht School of Dutch Realism was the main centre of Northern Caravaggism, the chief exponents were the religious and genre painters Gerrit van Honthorst (1590-1656), Hendrik Terbrugghen (1588-1629) and Dirck van Baburen (1595-1624). Caravaggio was also a major influence on Rembrandt (1606-69), notably his use of dramatic chiaroscuro. In Spain, Francisco Zurbaran (1598-1664) was a follower; in France, if Georges de La Tour (1593-1652) provided the most lyrical interpretation of Caravaggism, it was the Le Nain brothers who injected it with genuine Caravaggist realism; while in England Joseph Wright of Derby (1734-97), creator of the celebrated masterpiece An Experiment on a Bird in the Air Pump (1768, National Gallery, London), was a peerless follower. Caravaggism first fell out of fashion in Rome, during the late 1620s, although it persisted elsewhere in Italy, notably Sicily. In Netherlandish Utrecht and eastern France it remained influential well into the 1650s. Caravaggism's treatment of light and shadow helped to reinvigorate Italian painting by improving the three-dimensionality of figures. In addition, it allowed artists to control the focus of the painting, thus increasing its dramatic content. Lastly, in the hands of a virtuoso painter like Rembrandt, it enabled greater emotional depth and characterization. All these attributes were seized on by Dutch Realist artists, and by 17th century painters working on religious history painting relating to the inspirational Roman Catholic Counter-Reformation movement, known as the Baroque. Works by famous Caravaggisti can be seen in some of the best art museums in the world.